The perfect hairstyle goes a long way to completing your fairy princess look and it is a decision not to be taken lightly. Here are a few points to consider while making your choice. Once you have your dress, deciding on a hairstyle that will work is easier. If you’re unsure of what will look good, speak to your hairdresser for a few professional tips. Just be sure not to allow someone to bully you into a style you don’t love just because it is their taste. Everyone’s hair has limits and it helps to keep yours in mind. If your hair tends to fall flat easily, don’t try to curl it. Some styles don’t work with very fine hair, others don’t work with curly hair. Work with what you’ve got and keep your expectations realistic. If a fairy princess “up do” isn’t your style – don’t do it. You don’t want to be unrecognizable on your wedding day and you still want to feel like yourself. If you feel weird about your hair it will show. Book an appointment with a hairstylist and try a few different options before settling on one, especially if you are feeling unsure about what you want. Are you going to be wearing a veil? Would you like to have flowers in your hair? These things contribute to how your hair will work out. Don’t forget to take these things with you when you do the trial for your hair. 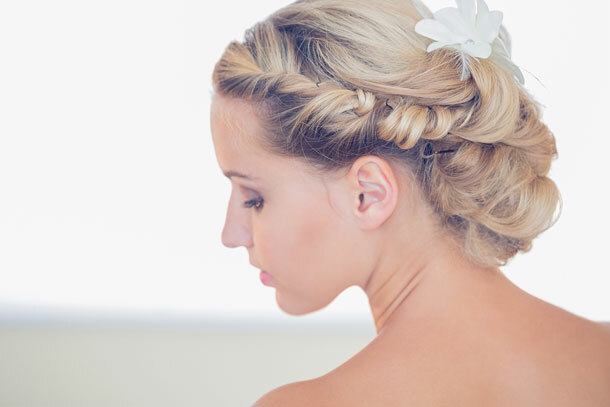 If you’re going to be getting married in the middle of a hot summer you might consider what might happen to your hair and what style will be least affected by sweltering heat. Your biggest consideration when it comes to your hair is your taste, and, of course, your partner’s taste. If your partner loves it when you wear your hair down then let that feature in your choice. Don’t let the idea that something might be “boring” stop you from doing what you like.